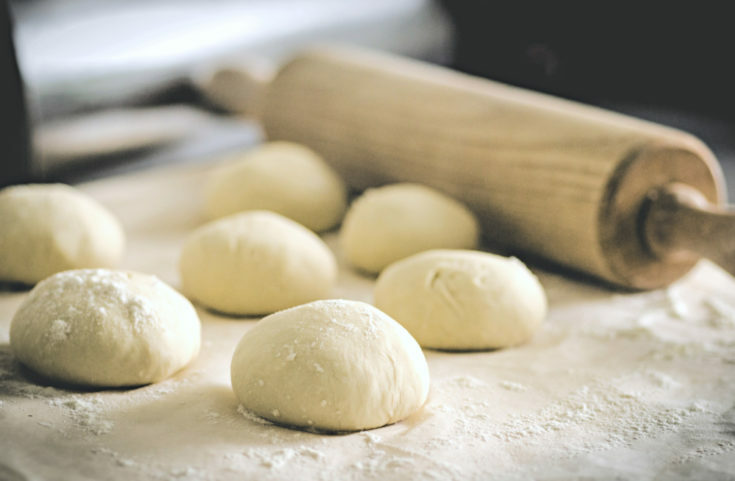 Homemade pizza dough is something you can make with a few simple ingredients and a little time. 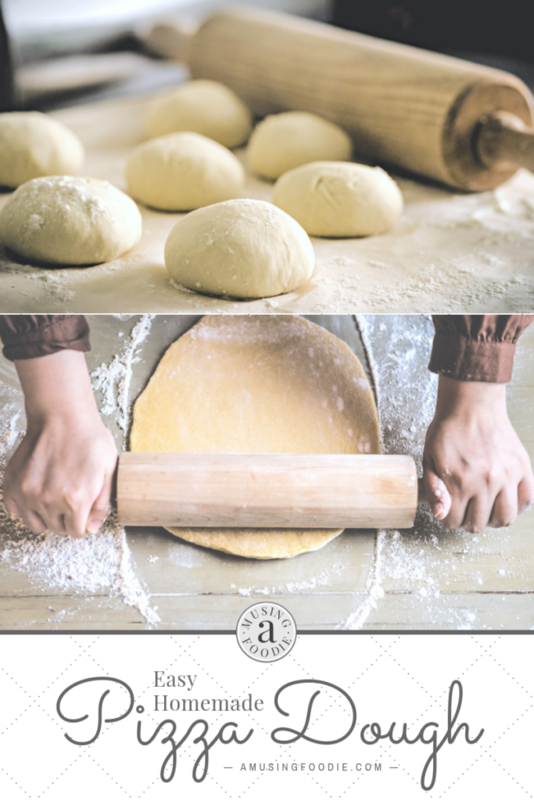 It’s an easy process and the end result yields the best pizza dough and a delicious, chewy hard-to-beat thin, class or thick crust! We eat a lot of pizza in our house. Sometimes that pizza’s homemade and other times it’s delivery or pick-up. I even keep a Tombstone in the freezer for those times we want a late-night snack or an easy dinner that requires minimal effort. There is, however, one very right way to do pizza, and that’s by making your own homemade pizza dough. I’ve substituted whole wheat flour for all-purpose flour, and even used a blend of both. I’ve let it rise for an hour and then baked my pizza, and I’ve also let it rise a few times over the course of a couple hours. I’ve also used the dough immediately, as well as frozen it for use later. 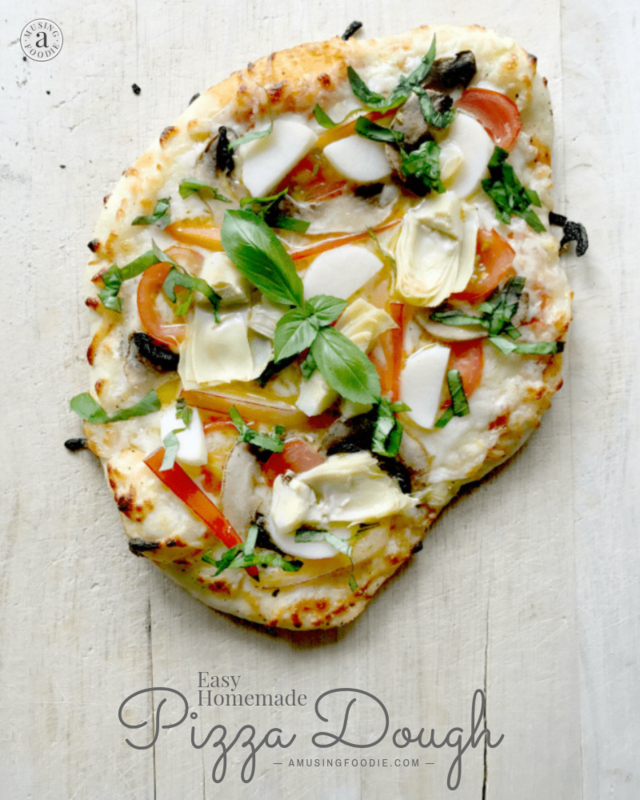 There’s really no excuse not to have homemade pizza dough on hand! Homemade pizza dough’s made with a mere six (that’s right, S I X) ingredients. Keep yeast packets in your pantry, and you’ll likely have what you need to make awesome homemade pizza dough, whenever the mood strikes. My recipe works just as well for thin crust, as well as thick crust or a more traditional crust. And when it comes to getting the pizza dough ready for the pan, no matter the thickness, I prefer to skirt the “expert” way of hand-tossing the dough. 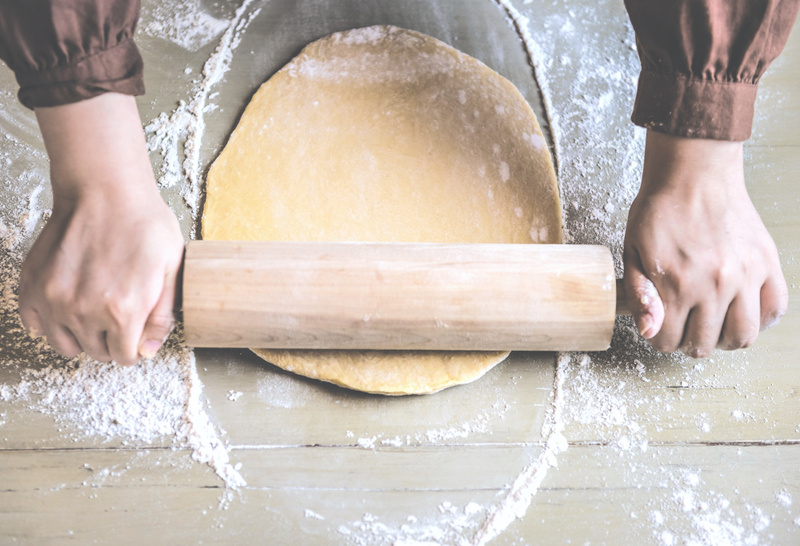 Instead, I use a floured rolling pin to roll my homemade pizza dough out to the thinness we’re looking for, and then transfer the rolled out dough to the pizza pan, where I then add sauce, cheese and toppings, before popping it into a hot oven. I used to use a pizza stone, but find it more complicated these days to top the dough and then transfer to the stone, even with copious amounts of cornmeal to help make things slide easier. Plus, a pizza stone needs to be preheated at the same time as the oven, so there’s no ability to build the pizza right on it. If you’re a toppings-fiend like me, transferring topped pizza dough from one surface to that hot stone in the oven can make for a big mess, as pieces of mushroom, peppers, and even cheese inevitably fall on the floor—or worse—the bottom of the oven. Pizza pan it is! And because I use a really hot oven, the pizza crust still turns out a nice mix of crispy and chewy. 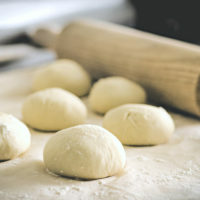 Homemade pizza dough is something you can make with a few simple ingredients and a little time. This recipe makes enough for 2-3 large pizzas or 8 personal pizzas. Move the oven racks to the lowest setting. Preheat the oven to 170°F. Once preheated, turn the oven off. Add the yeast, sugar and warm water to a KitchenAid mixing bowl. Let it sit for 10 minutes. Add the flour and the salt. Fix the dough hook to the KitchenAid and mix on low for one minute. Add 1/4 cup olive oil, and then continue mixing on low to medium-low for 10 minutes. Remove the dough hook and then disengage the mixing bowl from the stand. Form the dough into a ball—it should look and feel smooth. Coat it with a tablespoon of olive oil and place it back in the bottom of the mixing bowl. Drape the top with a towel and then set it in the oven to rest for an hour. 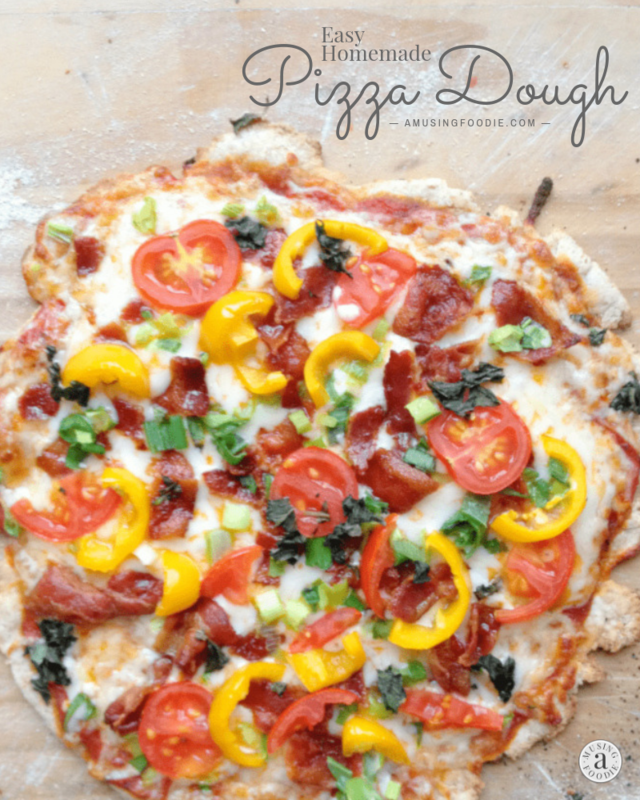 Remove the dough and it's ready to use for your favorite pizza recipe! To freeze the dough, form it into balls for single use portions (either large or small). Place them into zip top freezer bags and store flat. Let thaw at room temperature and then bake as usual!